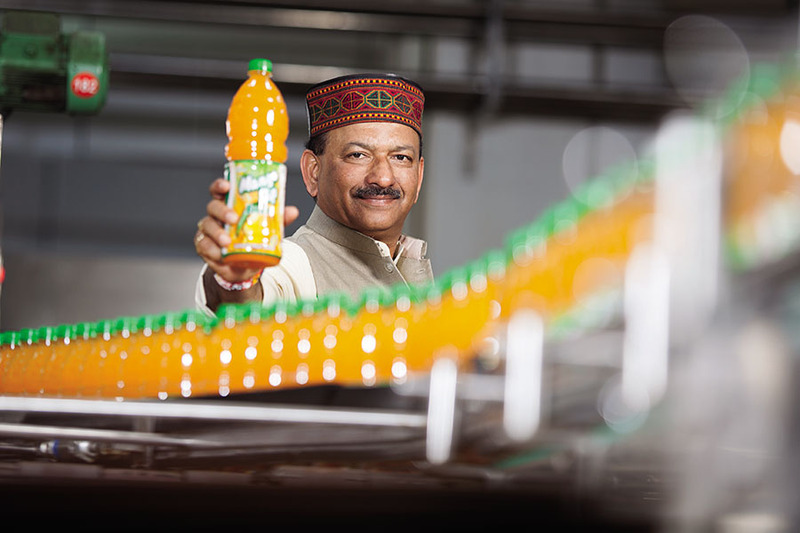 Dhirendra Singh grew up in rural northern India but later founded Manpasand Beverages in his adopted state of Gujarat. As he tells it, however, it was only while back there sipping tea at the border of Uttar Pradesh and Bihar in 2009, from a cup costing less than a rupee, that the juice baron had a eureka moment. The tea vendor expounded on how small rural shops like his could stock only goods priced below ₹10. The price point was critical, and it spurred Singh into action. He’d done well enough for a decade, shipping shelf-stable mango juice to villages and small towns in 200 ml packages. But by developing in 2011 a 125 ml bottle that retailed for ₹6, he reached the sweet spot. Revenues have risen more than six times in the years since, to $111 million in fiscal 2017. More than half the sales come from rural and small-town India. Profits have risen from $1.2 million to $11 million in that same period, earning Manpasand a spot on Forbes Asia’s Best Under A Billion list. Singh’s fortune—stemming from his 44 percent stake—stands at $330 million. A huge fillip is expected from a May 2017 tie-up with Maharashtra’s biscuit maker Parle Products (no relation to Parle Agro). The two have agreed to sell a combo pack of biscuits and juice across 4.5 million Parle outlets. Manpasand will have to manage the challenges of higher packing costs and lower margins that come with small packs, but it’s done that so far. And it’ll piggyback on Parle’s distribution heft. Singh, now 55, started Manpasand in 1997 with Mango Sip—which is still the flagship product, commanding three-fourths of sales. It has since expanded to carbonated fruit juices (Fruits Up) and other beverages. Young Singh arrived in Gujarat to work for a government petroleum company. His background as a volleyball player helped him net the spot—through a sports quota—after an undergrad degree from Gorakhpur University in Uttar Pradesh. “When I drank the water in Gujarat and ate the food there, entrepreneurship seeped into me,” he quips, referring to the ­proverbial bent there for business. An initial foray into real estate didn’t work out. So at the age of 35—with a wife and two young kids—he started selling mango juice. He’d take his old Ford Voyager van into the hinterlands to understand distribution at the shop level and roped in family and friends to gain a foothold near his hometown in Uttar Pradesh. “I am from rural India—I know the population, the area and the roads,” says Singh. At first he outsourced manufacturing in Mumbai. But when summer came and demand was at its peak, the Mumbai outfit could not meet Manpasand’s increased requirement and Singh lost the seasonal advantage. He couldn’t get his own factory till 2005. “I didn’t have capital or land. I didn’t know debit from credit. I only had the urge to do business,” he confesses, sitting in a tree-house-like office, surrounded by organic plants next to his juice factory on the outskirts of headquarters town Vadodara. Inside, it’s like a mom-and-pop rural shop, with juice bottles lined up on a shelf. Manpasand operates in a crowded segment, battling everyone from the roadside vendor selling sugarcane juice or lemonade to multinationals like the Coca-Cola Company and PepsiCo to mature homegrown players like Parle Agro and Dabur. Now Fruits Up is a $30 million brand with grape, orange and lemon flavours—mirroring Coke, Fanta and Sprite. It also offers fruit drinks in five flavours under that brand, benefiting from a concessional goods-and-services tax rate for drinks without synthetic additives. Investors, for their part, are heartened by Singh’s intense focus. “He has a deep knowledge of the distribution channels and outlet economics for villages and small towns,” says Vishal Sood, managing director of venture capital fund SAIF Partners with $3 billion in assets under management. SAIF, which invested in Manpasand as early as 2011, holds an 18 percent stake. Sood recalls an experience when Singh asked to be taken to a Chinese juice company in which SAIF in China had invested. He wanted to understand how to manufacture at scale because he knew he’d need to do that soon. After observing practices at plants in Beijing and Shanghai—which he’s now applied to his newer factories—he asked Sood to take him to the local market. His son Abhishek, 30, brings a similar obsession to the business. Meanwhile, Manpasand is spreading its wings in big cities. It has an entrenched presence with Indian Railways’ catering, where it gets a fifth of revenues. Now it’s moving into airport retail and into southern India. It’s selling in Nepal and wants to go to Bangladesh from there. “As it expands, Manpasand needs to strengthen the management cadre with senior professionals at the top and mid-level,” says analyst Aggarwal.